Fully standing desks are made with great attention to detail. Stylistically, the standing desks are a bit above the average of the market, mainly due to the aesthetically-pleasing maple wood desktops. These desktops also ensure that each standing desk is quite distinct. Although Fully also offers whiteboard desktops as well, their main value lies in the quality maple wood materials. Fully also offers a few other features. This includes various height memory options, cable management options, CPU holders, and even casters. There are many variations to these standing desks with colors such as silver or black or stains such as cherry or mahogany. The Jarvis hardwood standing desk is one of the most popular options from the manufacturer. With a Vincent Leman design, the standing desk looks apart. It is based on the simplicity which made Fully popular. At the same time, the standing desk is capable and durable. It comes with a maximum weight capacity of 350lbs, making it one of the most powerful designs in its class. Powered by a silent motor, the standing desk comes with a speed of adjustability of 1.5” per second. This happens with a maximum noise level of just 50db. This represents one of the most interesting options when it comes to what can be used in office spaces. It represents a simple and efficient solution which can easily be used for any type of office work. Since there are many types of accessories to choose for the standing desk, it can quickly become a solution which is not minimalist but rather custom-made for practicality. However, the unmatched appeal of the standing desk comes with the uniqueness of the maple wood as no two desktops are the same. The Atwood standing desk is unique in its design. 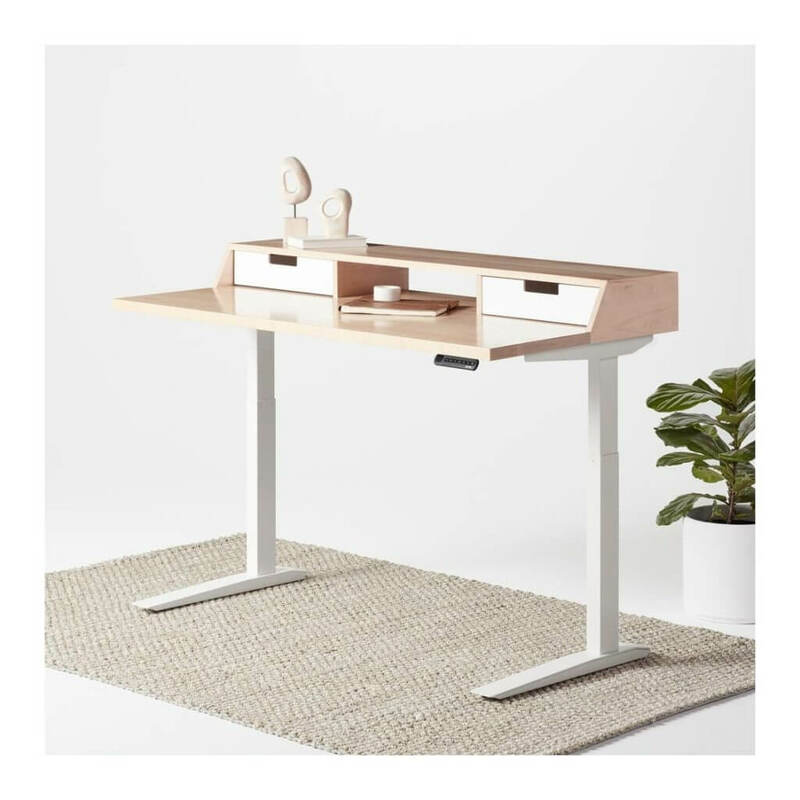 It comes with the same aluminum and maple wood materials Fully has accustomed its fans with but it represents a solution which also integrates mid-century and art-deco elements in small pieces of furniture on top of the desktop. With drawers and a shelf, the standing desk can be recommended for better document management around the office. It is also one of the few designs which combine old-style office appeal with new standing desk technology. Certainly, the Atwood is a rare design on a market where many standing desks tend to look the same. This is why it’s worth taking into consideration. However, it is unlikely to see the Atwood chosen for an office with multiple standing desks. Its role can be seen in single office desks or for those who prefer to work at home. At the same time, the design also has a few limitations. Those who are actively looking to maximize desktop space might not find it the most useful. Architects or engineers might need to work with extensive paper-based plans, which might not have enough space to unroll. But those who are working on a laptop or a desktop computer can find the Atwood is more than enough. The Jarvis whiteboard standing desk is the affordable alternative from Fully. As many users expect, it is also very durable and less sensitive compared to the maple alternatives. It comes with a scratch and stain-resistant desktop which recommend it among the most interesting options on the market. Even more, it can also be the Fully solution to integrate for multiple workers in a busy office as it is quite affordable. However, even the standing desk comes with its own limitations. One of the biggest issues comes with customization options. There are only three colors to choose from for the desktop. But those seeking the most affordable Fully option can consider it a great first purchase to alternate sitting and standing. The standing desk also comes with the lowest price guarantee. This means Fully backs it as the most affordable option when combined with a chair. The standing desk becomes the most affordable bundle on the market and this recommends it for first time purchasers. As its name suggests, the standing desk is L-shaped. With a bamboo board and a large storage capacity, it is one of the most interesting solutions when it comes to extra working space. Accountants or those working with multiple documents and monitors can find it very useful. The standing desk can also be the solution to consider as a corner desk. It can be one of the great designs for this purpose. As a larger desk, it also comes with increased weight capacity. At 530lb, it is the most capable design from the manufacturer. This easily recommends it for multiple uses, especially with heavy weights. Those using multiple monitors such as editors or photographers can find it useful. Even a printer can be stored on the standing desk, making it one of the most capable designs not only from the manufacturer but on the market. It is often said that all the great ideas have already been put into practice. But this is not true. This is certainly the case with the conference standing desk from Fully. Made with an elegant bamboo desktop, the standing desk is among the most interesting solutions for offices where there are regular meetings. Stand-up meetings are not new. Stand-up meetings at the table are not new. 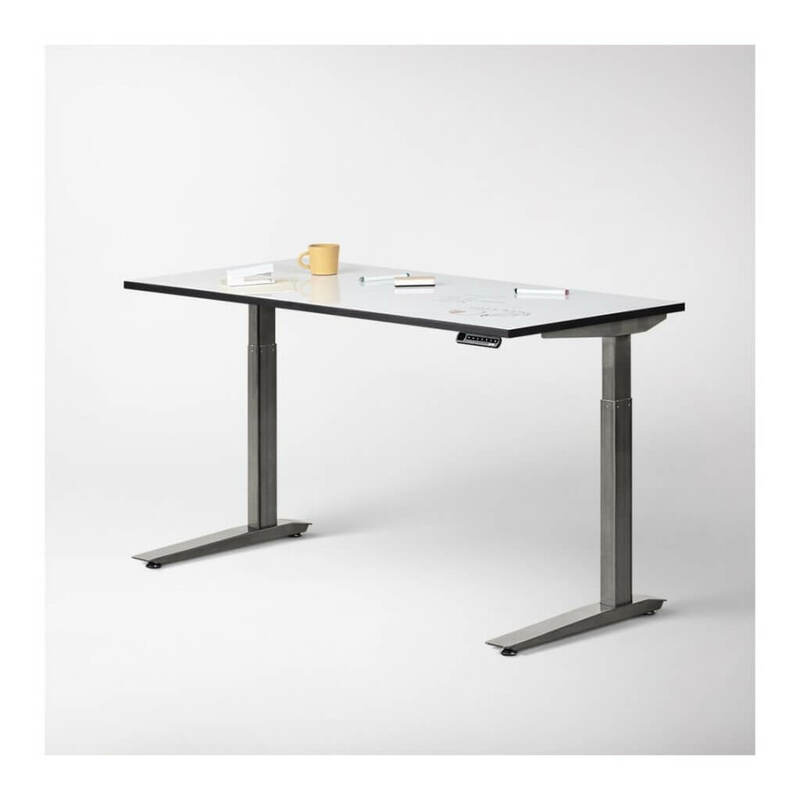 But having a height-adjustable desk for stand-up meetings can be one of the best solutions for quick rendezvous with the team. Unfortunately, the standing desk only comes with two stains. However, with its unique design and 600lb weight capacity, it can be one of the most sturdy and durable designs on the market. It can be the perfect solution to use by multiple employees at the same time. The Jarvis standing desk for kids is impressive by simplicity. At the moment, there are only a handful of manufacturers offering standing desks for kids. But the logic behind it is solid. Kids grow fast and they outgrow their little desks quickly. maple wood. Even more, it can also get them familiar with standing and sitting as methods of working at the desk. 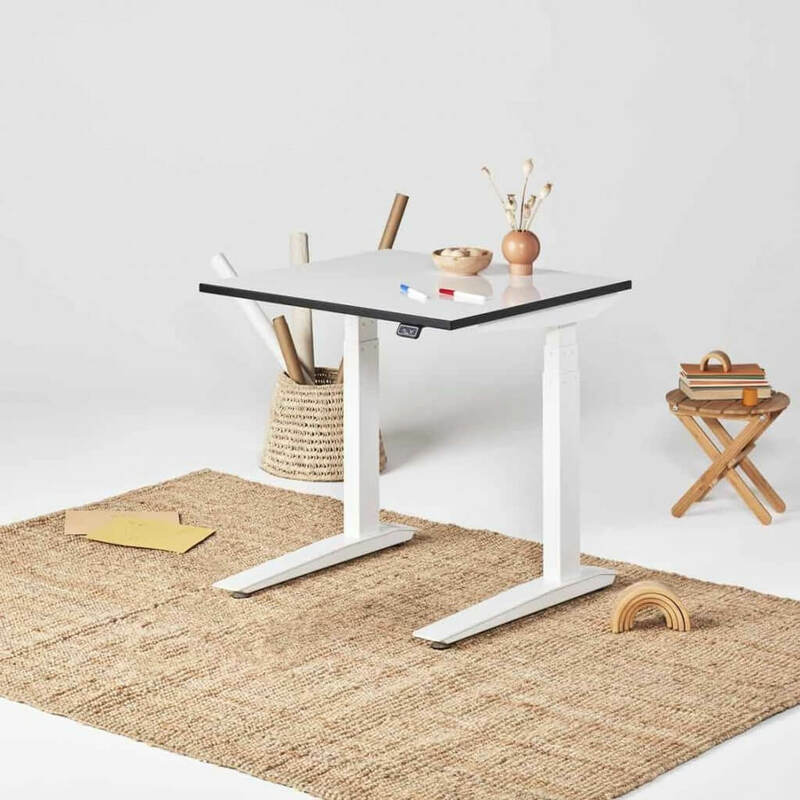 The miniature standing desk is available in bamboo, powder coat, and whiteboard desktops. It can also be combined with a series of kid-friendly chairs and small anti-fatigue mats. Kids might not have the patience to sit a desk for too long and this is why the design can be a hit. Of course, kids might not have the option of using these desks at school, but they can be a solution to use at home with various homework. Parents don’t need any special type of helping hand to install the standing desk. This can be done easily just by following the instructions Fully offers. The process should not take more than half an hour. One of the multiple additions offered by Fully comes with the power upgrade option. The manufacturer can add the plug for various electronics to the desktop. These accessories are available in a black or white cover and they can represent a practical solution. For example, those using the L-shape Fully standing desk might need to power multiple devices and in this case, the power upgrade is fully recommended. However, the plug-ins can also be installed on other desktops as well. Wire management options are offered by all standing desk manufacturers and Fully is no exception. They are easy to install and quite affordable. But their benefits outweigh the costs and they are highly recommended both for home and for office use. Installation is easy even after the purchase as most accessories can be bought from Fully at any time. Standard handsets are offered on most standing Fully standing desks. They only come with buttons for heights adjustments. For most users, this is more than enough. However, Fully also offers upgradable options for programmable handsets. As with most options on the market, this includes the ability to save up to 4 positions on the height, as defined by the user. Both handsets work well. Users need to determine if it’s worth investing in a solution which can be programmable. Those who might have to deal with multiple users at the desk, such as in some offices, might see the most benefits. Among other types of accessories, it is worth noting that CPU holders are special in their own way. They ensure the CPU is off the floor and off the desktop. It can even be installed vertically which ensures the CPU will not take too much space. As most accessories, the CPU holders can also be purchased separately both by Fully customers and by those using other standing desk brands. But there is also a sense that the accessory market is increasing for Fully as a whole. There are multiple chairs, stools, sanding pads, and other smaller accessories to choose from. 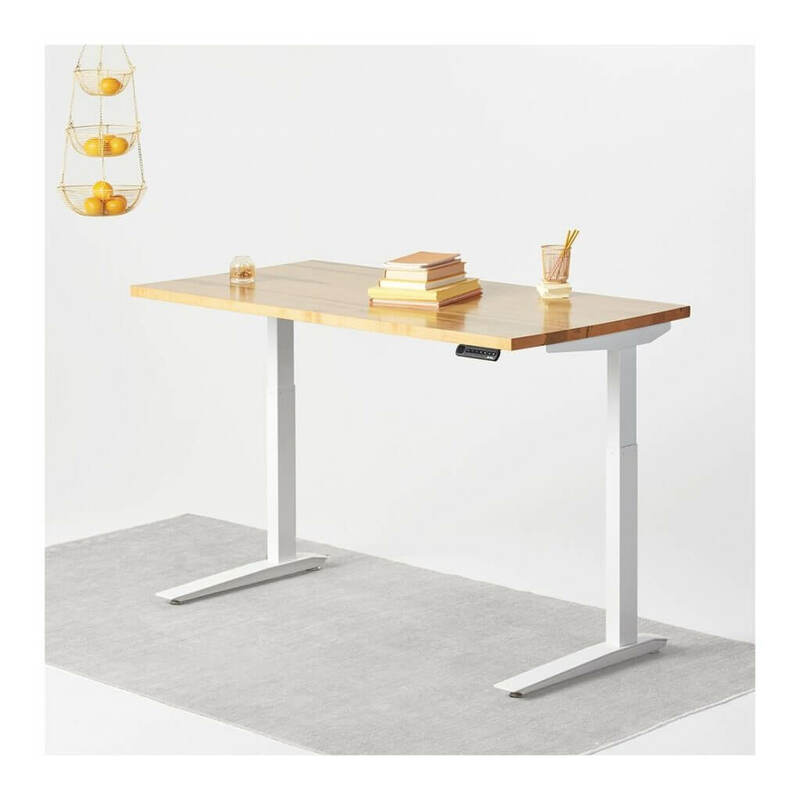 The manufacturer offers a full experience which is worth noting, especially compared to a few other names in the standing desk market. When it comes to finding the characteristic features of Fully, it’s worth noting that they are always those which are not easily copied by the competition. In the case of Fully, this comes in the form of the maple wood desktops. It is these desktops which are easily among the best on the market. Even if the desktops hold the signature of a famous designer, they are still unique in their own way. Each piece of maple is different and this makes the standing desks quite unique. On the other hand, there are a few other benefits to also consider. This includes the capacity of having a standing desk for kids. Since there are so affordable, they can also be the entrance towards a new market, with more products targeting kids which Fully can take advantage of. Other Fully signature characteristics include the full customization of the standing desks. This includes having the ability to choose the solutions which are best for cable management, keyboard comfort, document storage, and CPU placement. With so many options to choose from, there are clear signs that the manufacturer can be one of the recommended names when it comes to customization. However, no manufacturer is perfect. Fully has its own drawbacks. This includes having to pay more for a handset upgrade. It also includes limited color options. Those who want anything different to the stains on offer do not really have too many colors to choose from for the desktops. Another important consideration to make comes with the range of chairs and stools. They might not be the most ergonomic or comfortable options on the market. However, in a way, Fully is not aiming at offering the most comfortable products on the market. This can be seen with the price guarantee policy on most products. It means that the manufacturer aims to offer the lowest price for the chair/desk combination and this might not leave too much room for any type of premium characteristics apart from the solid wood. Fully standing desks are among the most recommended on the market. Their attractive pricing makes them a reliable option and they can also become one of the products which are easy to work with, especially in the conditions in which there are not too many alternatives at these prices. In terms of functionality, the standing desks work very well for their simplistic profile. They might not integrate any AI technologies, but they can represent one of the most reliable lineups of standing desks. With an unpretentious design with a few premium characteristics, Fully is recommended for the home and office worker. 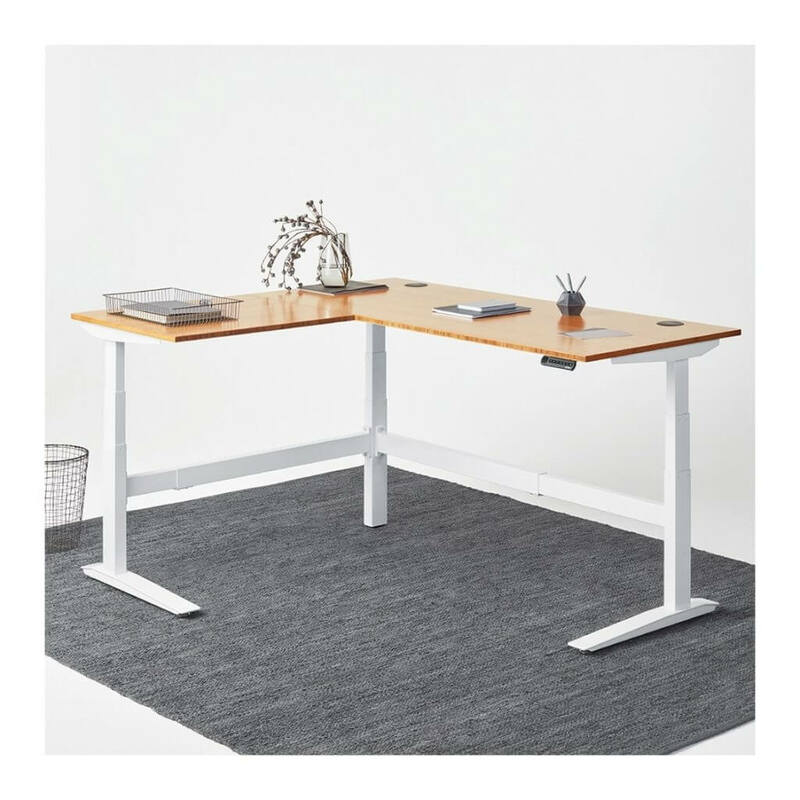 With unique designs such as the L-shape desk, there is no reason to doubt that Fully covers even the needs of the most demanding modern office workers.